To impart value based technical education and train students to turn out full- fledged engineers in the field of Electronics & Communication Engineering with an overall background suitable for making a successful career either in Industry/Research or higher education i.e., from A.Y 2008-09 with an intake of 60 students. Presently, the intake of the ECE Department is 180 students. The department has faculty strength of 26 well qualified, experienced and dedicated Post graduates with Three Doctorates and some of them are pursuing PhD in different streams. 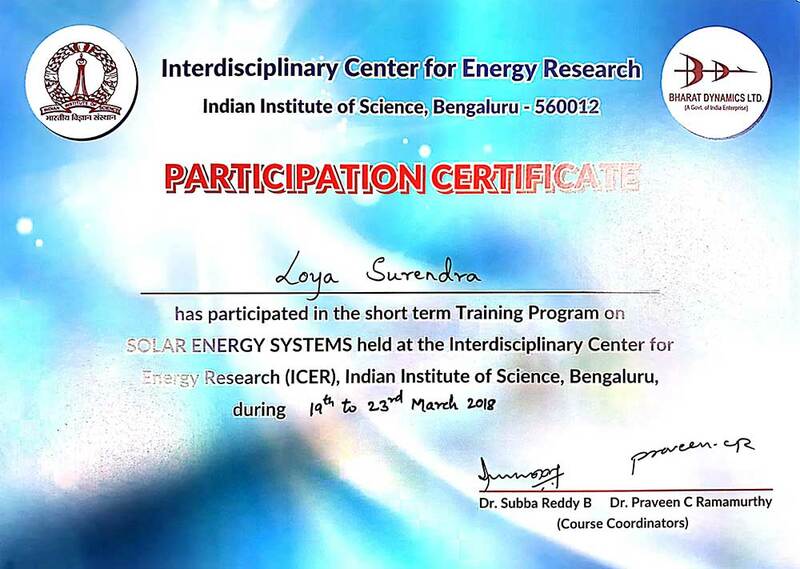 ECE Department has always been on a high growth path with strong committed faculty towards engineering education, who work with zeal and enthusiasm The Department motive is to provide a vibrant and optimum learning environment to the students in order to help them excel in today's competition globally. To keep in pace with the current technological trends, the department has established few centre of excellences to incorporate all advancements in collaboration with industries. This gives the students a hostile and pragmatic view of the present scenario of Electronics and Communication industry. The department encourages students into postgraduate studies and prepares them for leadership roles in research and development. Along with UG one M.Tech course in VLSI & Embedded Systems from A.Y 2012-13 with an intake of 18 students is also offered. 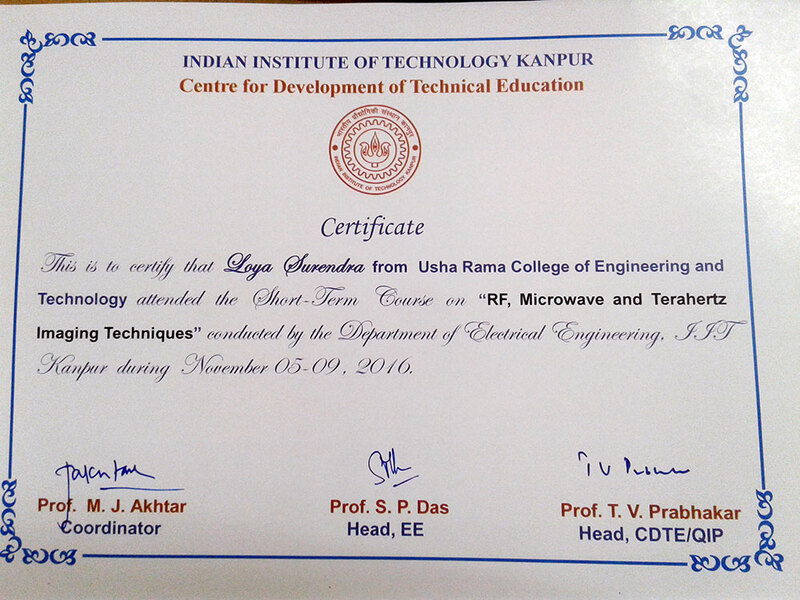 The ECE department has good infrastructure with 8 different labs namely Microwave Engineering lab, Microprocessor and Microcontroller Lab, Linear & Digital ICs Lab, Communications Lab, Computer Lab, EDC Lab, PDC Lab, DSP & VLSI Lab. All the labs are fully equipped to cater the present day advanced technology. Computer lab is fully air conditioned with necessary systems and softwares. The department consists of 10 well-furnished classrooms with e-class room facility and three staff rooms, HOD's room, professor cabins and department library comprising of different textbooks, magazines and competitive exam preparation books. Apart from JNTUK Curriculum, we are offering hands on experience lab i.e. 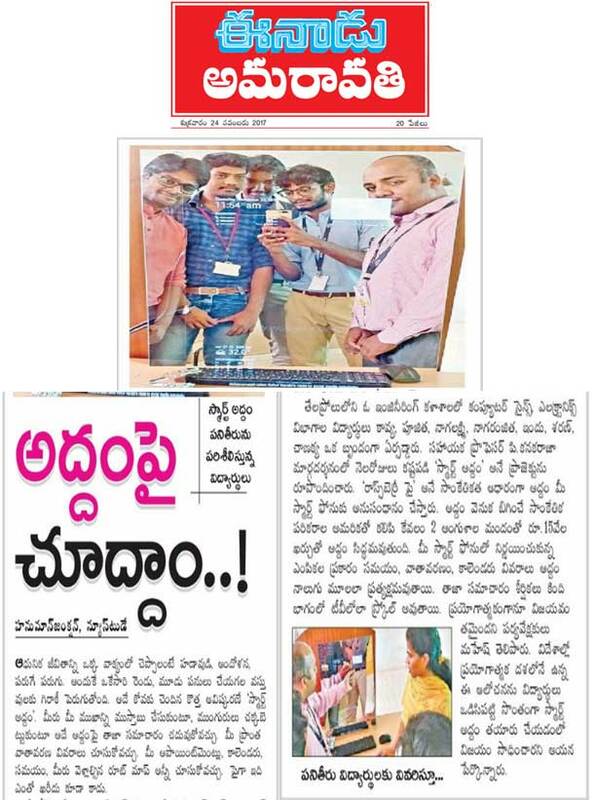 Work Study Programme for II and III Years Students to Improve the Technical Skills of the Students. Producing innovative, creative and ethical Electronics & Communication Engineers with research focus to meet socio-economic needs. a) to apply knowledge of mathematics, science, fundamentals of engineering to solve electronics and communication engineering problems. b) to identify, formulate and analyze electronics and communication systems reaching substantiated conclusions using the first principles of mathematics and engineering sciences. c) to design solutions to electronics and communication systems to meet the specified needs. d) to design and perform experiments of complex electronic circuits and systems, analyze and interpret data to provide valid conclusions. f) to demonstrate knowledge of contemporary issues to assess the societal responsibilities relevant to the professional practice. h) to understand professional and ethical responsibilities and norms of engineering practice. j) to communicate effectively with engineering community and with society at large. l) to demonstrate knowledge and understanding of engineering and management principles and apply these to manage projects. I. Excel in their professional career and higher education in Electronics and Communication Engineering and related fields. II. Exhibit leadership through technological ability and contemporary knowledge. III. Adapt to emerging technologies for sustenance in their relevant areas of interest. 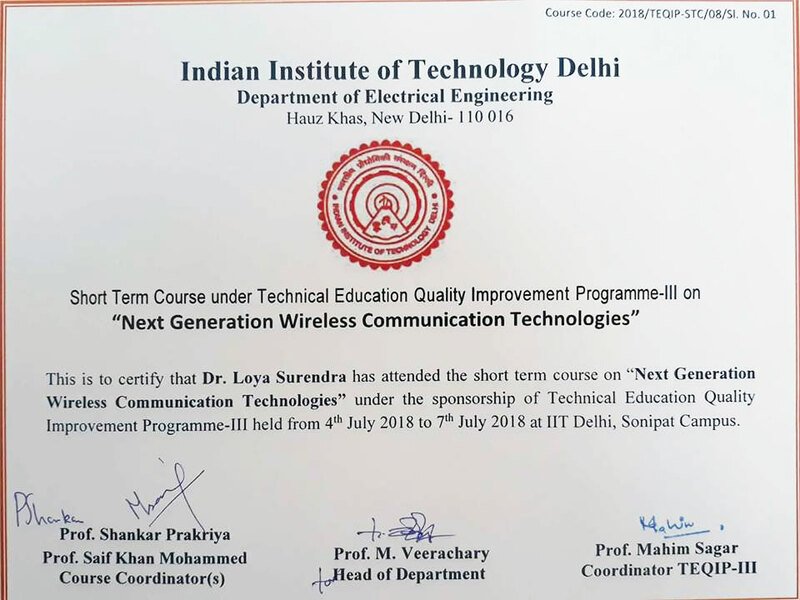 04-07-2018: Mr.Loya Surendra has attended the short term course on "NEXT GENERATION WIRELESS COMMUNICATION TECHNOLOGIES " UNDER THE SPONSORSHIP OF TEQIP-III HELD FROM 4TH JULY 2018 TO 7TH JULY 2018 AT IIT DELHI.